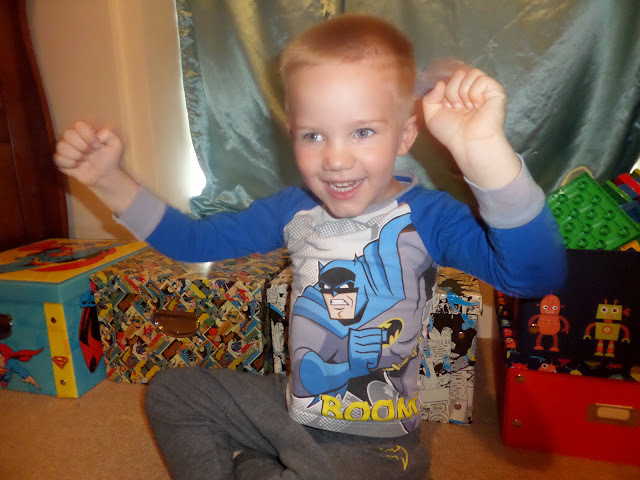 Where Roots And Wings Entwine: Dobble Kids game - review and giveaway. Dobble Kids game - review and giveaway. 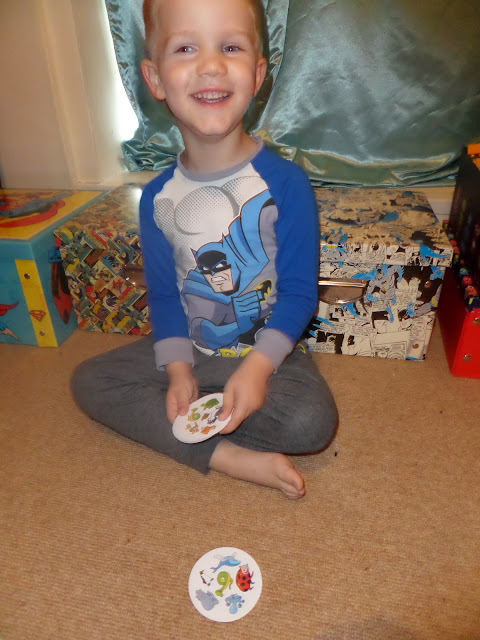 As Bug loves puzzles, board games and card games, he was delighted to be sent the new Dobble Kids game to play with. Based on same idea as the original Dobble game, Dobble Kids is a version aimed at children aged 4+ years and for 2 to 5 players. 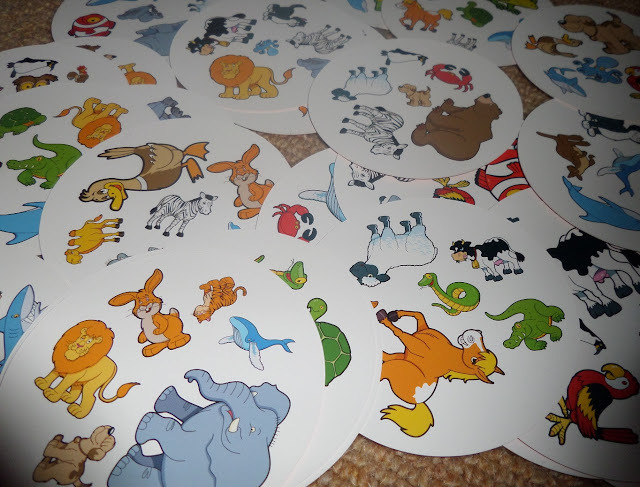 So that the game is easy for little ones to play, Dobble Kids features easily recognisable picture of animals. 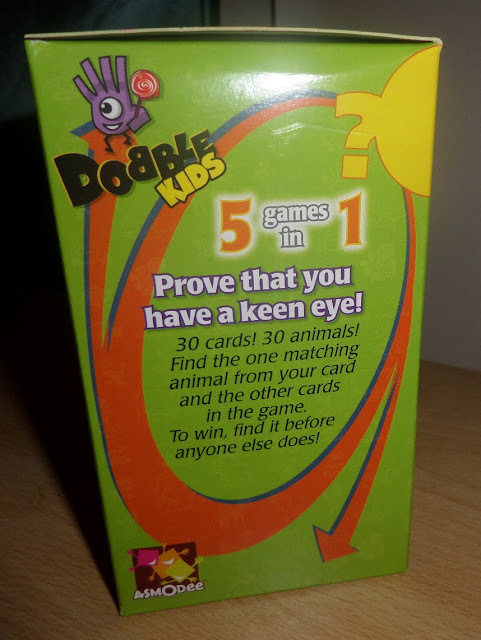 Also unlike the original Dobble game, Dobble Kids has only 30 cards making for easier and shorter game play for young children. 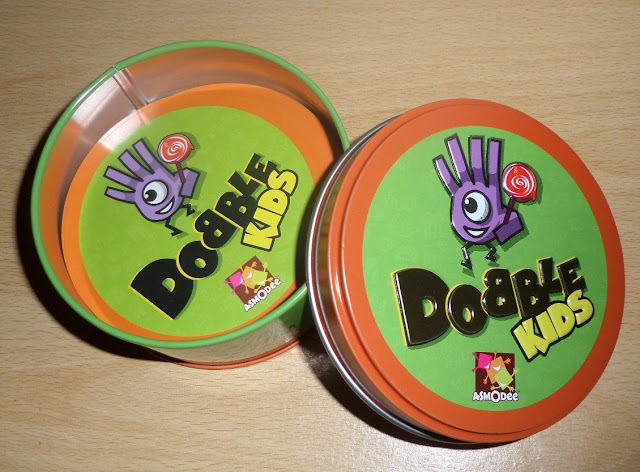 I was very impressed with the fact that Dobble Kids comes in a lovely and very sturdy tin which can be used in-between game play to store the 30 cards safely and securely. As the round storage tin is a metal tin it won’t get tatty or broken as a cardboard box would which is a big plus for me. The 30 cards are all decorated with 6 animals each but as there are a total of 30 animals used in the whole set and every card is unique only 1 animal from a card will match with any other card. The brightly coloured animals adorning the cards are all different sizes making it harder to spot the matching animal on each card but all are easily recognisable, and are very clear and well-illustrated. Along with the cards also in the tin are instructions that tell you how to play the 5 mini games that can be played with the set, with the different mini games being great for varying skill levels. The basic concept of Dobble Kids is snap. Players need to spot the animal in common, using quick thinking to be the fasted to call out the matching pair with the winner being the one with the most/least cards depending on the mini game played. As the game is so simple yet fun to play it has only taken Bug a few moments to learn how to play and even though the game is simple he has yet to get bored with it as the challenges the game provides has grasped Bug’s attention with him enjoying playing it again and again trying the different mini games. Bug’s competitive streak has come to the forefront playing the game especially once he had a taste of winning with his quick thinking meaning he routinely beats me on reaction speed to find the matching animal. 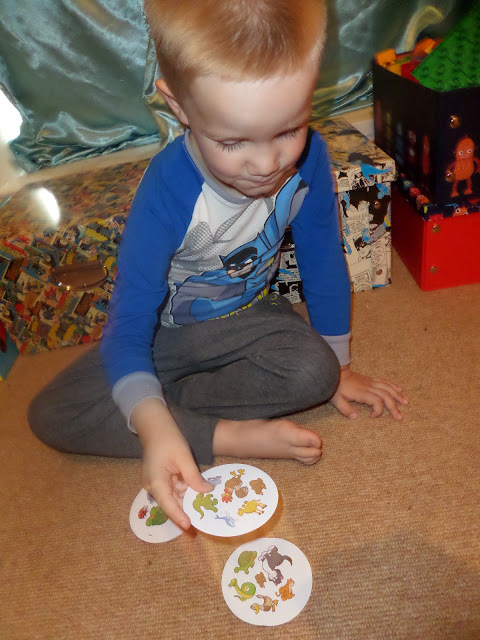 Not only does Bug enjoy playing this as part of a group and following the mini games, he has also enjoyed playing it alone to find the matching animals and making up his own mini-games with rules he has thought of himself. 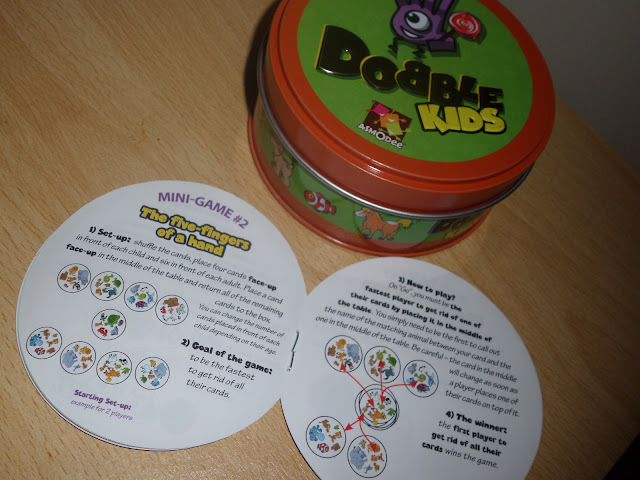 As well as being a fun game to play, Dobble Kids is also great for learning. The educational benefits Bug has gained from this game includes learning about different animals, stimulating the mind, improving hand-eye co-ordination, developing matching and memory skills, encouraging personal and social skills and boosting observational skills. A bonus of the game is its portability. I love that the compact tin is small enough to pop in my bag so that it be taken on our travels to friends and families houses’ so Bug can play with his friends. 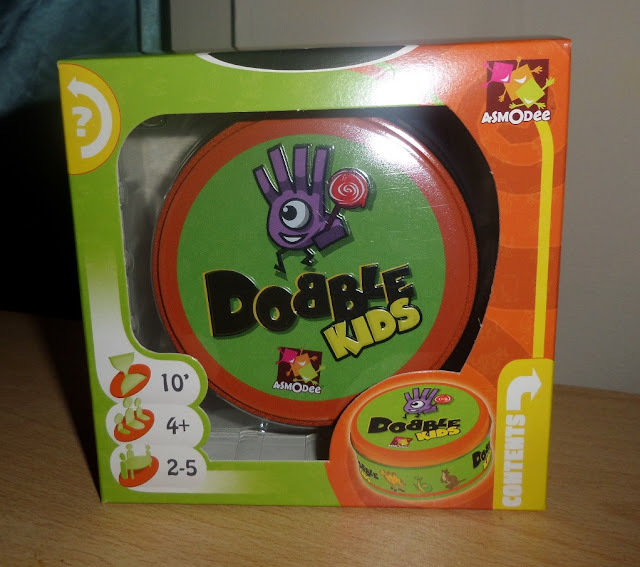 Dobble Kids has been a big hit in our house and the child-friendly game is fast, fun and easy to play. 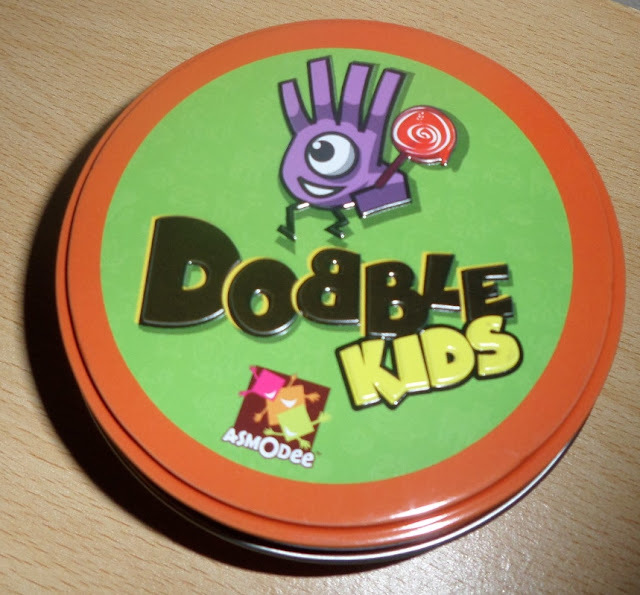 If the past few weeks have been anything to go by I am sure Dobble Kids will become a classic game that often sees the light of day from our games cupboard for years to come. 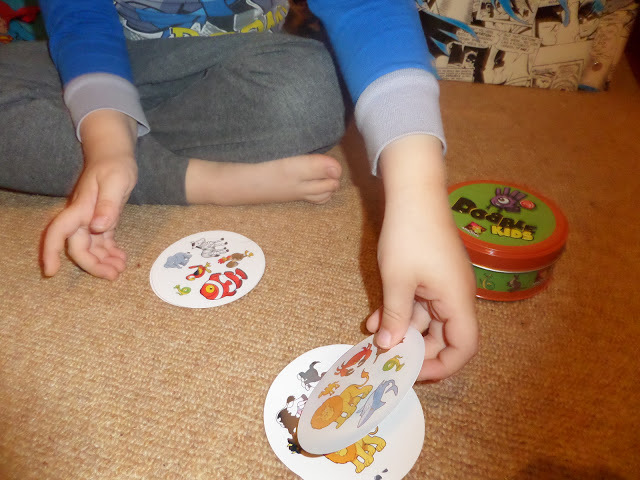 As this is such a loved game I plan on getting Bug the classic Dobble game from House of Fraser's toy department when he is a little older so that we can have more family-friendly fun with the Dobble cards which feature different, everyday images. Dobble Kids has a reasonably priced RRP of £12.99 and is available on the high street from stores such as Waterstones. 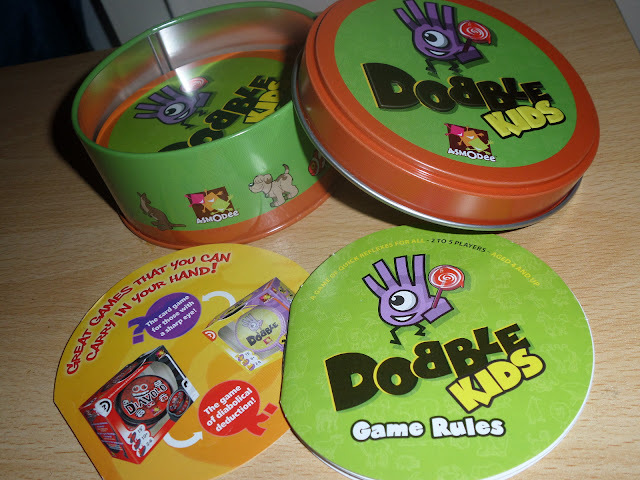 To celebrate the Dobble Kids game Esdevium Games are offering my readers the chance to win a Dobble Kids game. I used to love playing both SNAP! and Top Trumps! Mine love Top Trumps and Snap! My Jake loves Rummy. the card game. I loved UNO as a kid. Not sure how classic it is but my favourite as a child was Mousetrap! I loved playing cards for pennies, or Heroquest. Snakes and Ladders for both questions but there are so many excellent card and board games now that it is difficult to choose.